What a way to kick off Turkey! Hot-air ballooning in Cappadocia, Turkey (Kapadokya) was a combination of things we feared- for Jacob it is heights and for me it is waking up before the sun is up. OK, not a fear but an aversion still the same. We both overcame (the struggle is real) and it was delightful. Our shuttle bus call time was at the unearthly time of 5:15 a.m. 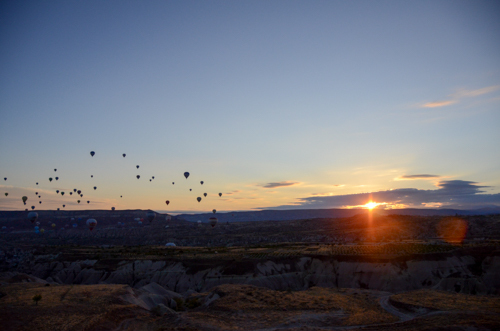 Hot air ballooning follows the air currents and it is best early morning. 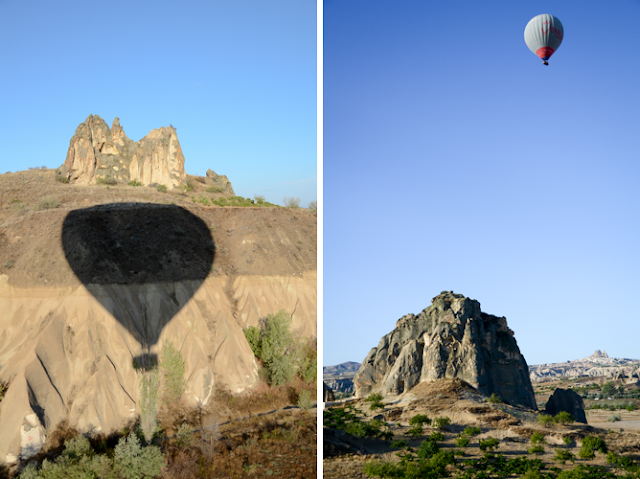 The balloon business is booming in Goreme with hundreds of balloons launching each morning. 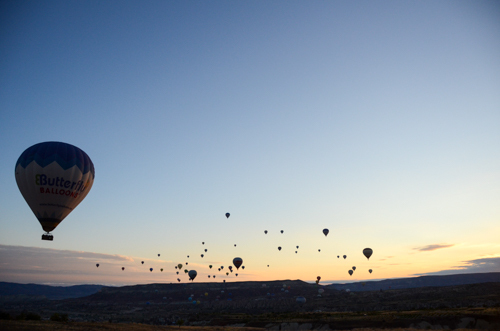 Before we get started, click here for a little hot air ballooning soundtrack. You're welcome. 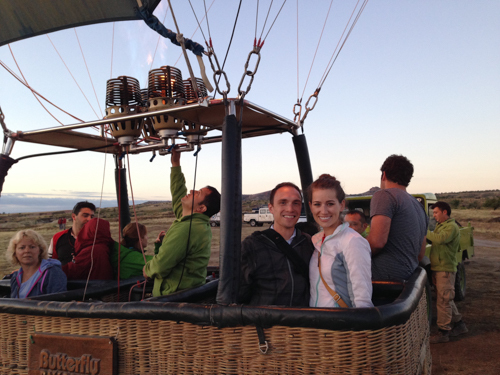 Our first hot air balloon ride ever. We tried to act cool, like we do this all of the time, but I'm pretty sure we came off like 4-year-olds at Disneyland. Our balloon basket had five compartments: one for the pilot and four for the passengers. We had our own little section that we could both easily move around in. After a review of the rules (don't climb out of the basket), we were off! The ride is so smooth and graceful that Jacob didn't even panic unless he looked over the edge of the basket. And it was usually because I told him to look over- I'm the worst person to sympathize with someone who is scared of heights. After the flight (which lasted about 75 minutes in air), the balloons are all scattered over the valley. Trailers and crews race all over the valley, pealing around corners to find their blown balloons. 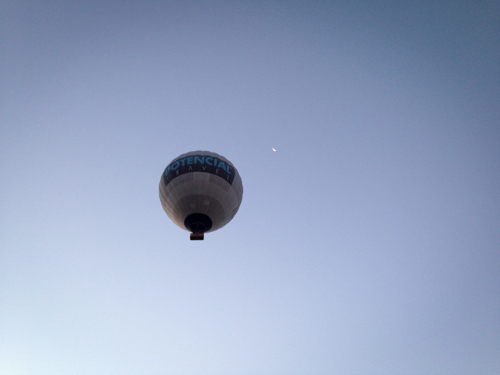 Our pilot and crew landed our balloon directly onto the truck trailer. Very impressive! The crew quickly set up a champagne and fresh fruit landing party to celebrate that no one fell out of the basket, er... for a successful flight. While this experience was more expensive than a plane ticket to NYC, it was one of the coolest things we did. You must book in advance as many of the highest-rated companies book out. We booked with Butterfly Balloons because it was the highest rated. Price included transport, light breakfast before the ride, and a champagne toast after. Weather largely dictates if balloons launch. 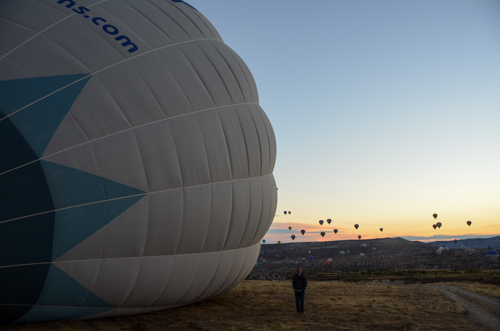 If you are in Cappadocia for more than one night, book the balloon ride for the first day. If it is canceled due to weather, they will try again the next day. Bring a jacket- it is chilly 2,000 feet in the air! 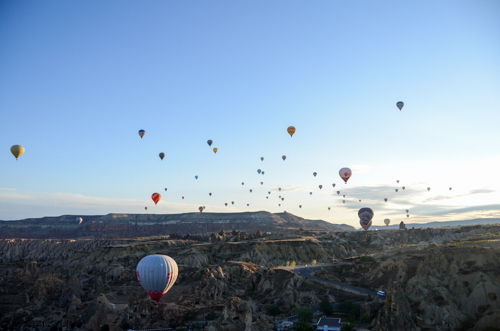 If you can't swing the pricey fee, you can still wake up early and watch the beautiful balloons over the valley each morning.